Franklin Roosevelt was elected to four terms as U.S. President, serving from 1933 until his death during his fourth term in 1945. He led his country out of the Depression and through World War II. The worldwide conflict required the Allied leaders — Franklin Roosevelt of the U.S., Winston Churchill of the U.K., and Josef Stalin of the U.S.S.R. — to travel as no previous leaders had. They met at conferences in Argentina, Casablanca, Cairo, Tehran, Yalta, and more, all at a time only before intercontinental jet travel, but during wartime. The complete list of international conferences during that war is impressive. A Douglas C-54 Skymaster was the first purpose-built U.S. Presidential aircraft. This was a four-engined transport introduced in 1942. It was derived from the civilian DC-4, and was one of the most commonly used long-range transports for the U.S. armed forces during World War II. It had a length of about 94 feet and a wingspan of 117.5 feet. With four Pratt and Whitney R-2000-9 radial engines, it had a cruise speed of 190 mph, a maximum speed of 275 mph, a range of 4,000 miles, and a service ceiling of 22,300 feet. 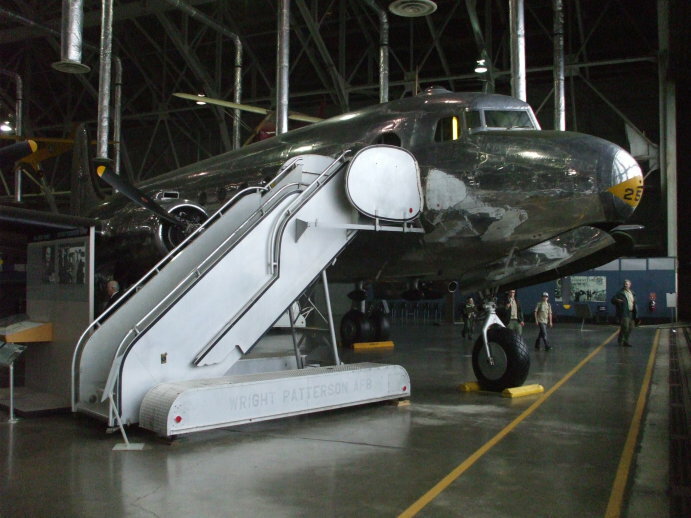 In 1944, a C-54A was converted to a Presidential transport version designated VC-54C. The aircraft was considered a restricted area because of the strict wartime security. Ground service personnel not allowed on or near the plane began to refer to it as "the sacred cow". The White House Press Corps overheard this, and began referring to the aircraft as the Sacred Cow in their writing. No, this is not FDR! It's a rather startled looking manniquin on board the Sacred Cow. It is now at the National Museum of the U.S. Air Force at Wright-Patterson Air Force Base outside Dayton, Ohio. 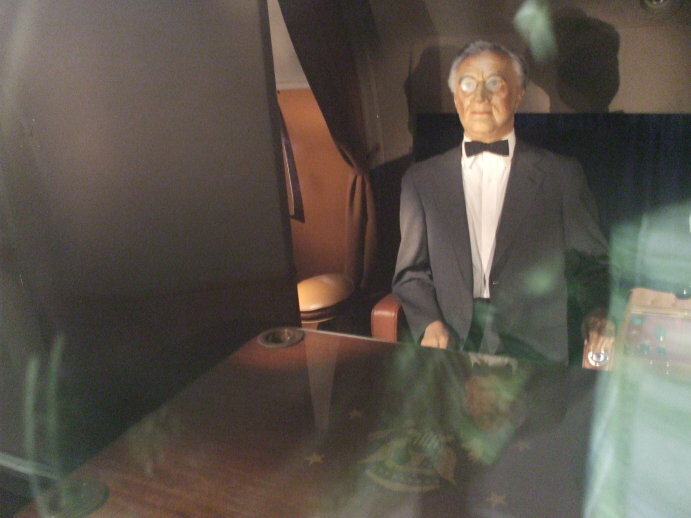 FDR's manniquin is seated with his back to the left fuselage wall. This is a meeting area with a conference table. Roosevelt's on-board lavatory is barely visible through the curtain behind him. Here we see the Sacred Cow at the National Museum of the U.S. Air Force at Wright-Patterson Air Force Base outside Dayton, Ohio. Personal compartments were located toward the rear, staff and aircrew areas were forward. A few bunks like those on overnight trains lined the narrow central passageway forward, providing much better overnight rest than the tightly packed coach seats of today. Two-way communication gear was on board, but the state of the art in the 1940s was analog HF voice and CW. Somehow things still were accomplished. Roosevelt's successor Harry Truman also used the Sacred Cow until it was replaced with his Independence. Truman signed the National Security Act of 1947 on board Sacred Cow, creating the U.S. Air Force.